It has been reported that our esteemed leader Rupert Murdoch is set to take full control of BSkyB (of which he/NewsCorp currently own a 39% stake). Yes this makes business sense, and to be honest, most people, myself included, always thought that Sky was owned by Murdoch anyway. But the thought is still a scary one. Mostly I say this because I dislike the man’s politics. I personally find his various publications and media outlets somewhere between irritating and outright offensive (on a scale between The Sun and Fox News with The Times and Sky News somewhere in the middle). However, the real issue is the question of control. It can be comfortably argued that the free press is the vanguard and defender of democracy. That it has become increasingly beholden to investors and shareholders is a great tragedy as newspapers and television stations inevitably slide towards lowest common denominator politics and news coverage with a view to satisfying advertisers. This is of course necessary from a business perspective, but damaging to democratic process. No matter how independent most people would like to think their thought is, there is no escaping the fact that the majority of our opinions are at least influenced, if not dictated by the information we are exposed to. The media holds an enormous influence over what people think, whether we like it or not. 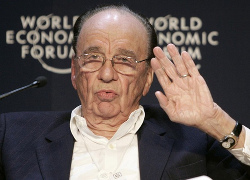 One man owning the largest paid-for television service, two of the highest circulating broadsheets and the biggest selling newspaper in one country, not to mention his Australian and American assets is simply a dangerous state of affairs. This without taking into account the enormous political sway he holds with politicians all too aware of the effect of mass media on their electorate’s opinion. That Fox News in particular has a somewhat “casual” relationship to the truth doesn’t necessarily reflect on the attitude to press responsibility Murdoch’s other channels (online, in print and on TV) hold, but it is certainly telling that Murdoch allows his biggest station to act in such a brazenly irresponsible manner. I’d rather no one possessed so much influence, but if one man is going to control so much media and influence so much thought, all the way from non-voter to Prime Minister, I’d rather it wasn’t Murdoch. The problem with life is…Murdoch is trying to steal our thoughts.